Decades later, Led Zeppelin's The Song Remains the Same is still beguiling and definitive, and it sounds better than ever with this Rhino remaster. 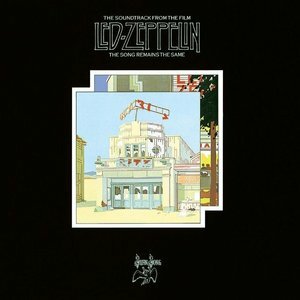 Although initially criticized by fans (and the band members themselves) for its poor production, Led Zeppelin's The Song Remains the Same is, in hindsight, widely considered their definitive live artifact. Recorded at Madison Square Garden at the tail end of July 1973—and released in October 1976—it provided a strong overview of the band's catalog thus far. Now, it's been remastered yet again (as a means to close out the recent series of deluxe reissues and commemorate their 50th anniversary later this year), and it sounds improved. While die-hard fans of the studio versions may still have some gripes with the alternate and scaled down replications here, there's no denying that The Song Remains the Same still serves as a powerful document of the English quartet at the peak of their influence. For the most part, these songs resemble their official counterparts fairly well and possess strong clarity and mixing. For instance, "Rock and Roll" kicks things off with more punch than ever and barely deviates from how it is on Led Zeppelin IV. Elsewhere, "Celebration Day" represents each instrument well, and Jones' bass patterns sound especially pronounced during Page's solo on "Over the Hills and Far Away". Comparatively, "Since I've Been Loving You" features dynamics that match the take on Led Zeppelin III alongside some even more fiery guitar work, and "The Ocean" is every bit as infectious as on Houses of the Holy yet it also has far more bite. As such, his updated mix really highlights Led Zeppelin's live performance ability to up the ante while also staying true to form. Of course, what's even more worthwhile (although not always superior) is the quartet's ability to offer new takes on the beloved material. "No Quarter" is surprisingly nuanced and full-bodied for an in-concert rendition, and its extended duration allows for even more emotional fury. Likewise, fan favorite "Stairway to Heaven", while naturally missing some of the embellishments of the original, arguably makes up for it with a fresh guitar solo and vocalist Robert Plant's now-synonymous, "I think this is a song of hope" and "Does anyone remember laughter?" banter. Perhaps the most inventively odd variation of all is the ethereal dissonance and subsequent jazzy break during the lengthier take on "Whole Lotta Love". Then again, at roughly five times the span of the 1969 Led Zeppelin cut, the 29-minute "Dazed and Confused" is easily the standout example of why The Song Remains the Same, well, remains an essential part of the group's legacy. Despite being a bit meandering at times (as is usually the case when artists drastically jam out on a track in concert), it's always at least interesting and surprising, with some truly spellbinding musicianship from all involved. It's a dense sonic journey that demands many revisits. Decades later, The Song Remains the Same is as beguiling and definitive as ever in exemplifying Led Zeppelin's place as a one-of-a-kind outfit that's spawned countless imitators and proteges. They're equally adept as replicating and deviating from studio material to offer fans a simultaneously familiar and surprising live experience, and this latest reissue is certainly the best offering yet in terms of capturing every nuance and attack the quartet laid out on those seminal summer nights in New York City.